a complete protein, packed with amino acids, vitamins and minerals. It’s a SUPERFOOD! For breakfast try quinoa as a substitute for oatmeal, or use it to make quinoa cakes instead of pancakes. Quinoa adds great texture to baked goods like muffins and scones. For lunch or dinner try sliders made with chopped herbs, grated cheese, eggs and chopped vegetables - either pan-fried or oven baked. How about using it in a casserole baked with roasted winter vegetables, quinoa and creamy cheddar cheese sauce. Try it in a slaw with shredded broccoli and toasted almonds. Quinoa in a soup adds nutrients, flavor and helps to thicken the broth. Substitute quinoa, which is gluten free, for any grain in your favorite dishes. Available in white, red and a tricolor combination (which adds black to the mix), all with a slightly nutty flavor ranging from mild to earthy, respectively. Often I mix them for variety creating a vivid contrast to the other ingredients. Its versatility knows no bounds. During the winter months this super grain makes any salad heartier. Make it with colorful sautéed and roasted vegetables, legumes and herbs; top with toasted nuts or diced cheese. Here is a preparation that has lots of great flavors, textures and is full of nutrients. Served warm or cold this recipe makes a great main course or side dish to any entrée. Prepare the vegetables for roasting. 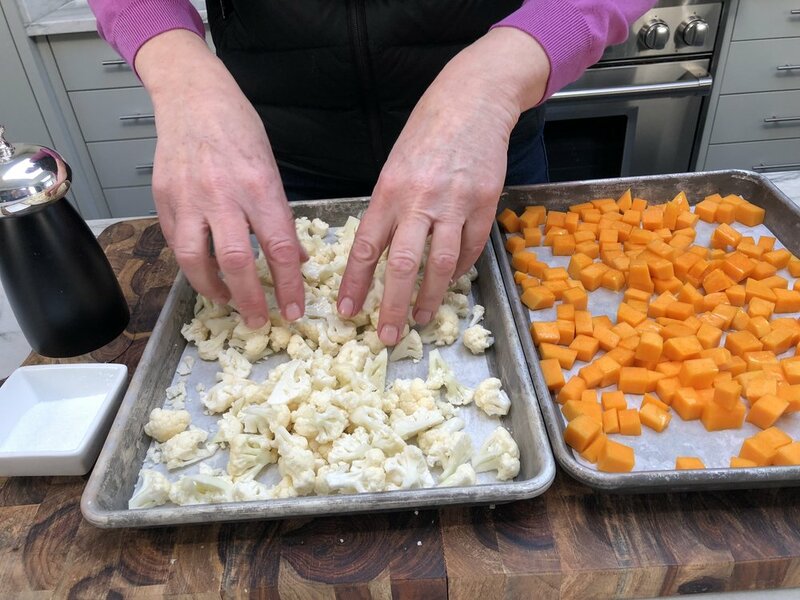 Peel butternut squash and chop into small bite sized cubes, then cut cauliflower into small florets. Place them both onto a parchment lined sheet tray, drizzle with oil and season with salt, pepper and Aleppo pepper flakes. Bake at 375 degrees 25-30 minutes. While squash and cauliflower are in the oven roasting, chop onions, fennel and bell peppers into small dice. The shiitake mushrooms are sliced into strips across the button, then sliced in half. Sauté them in one pan with olive oil starting with fennel, then add onions and then peppers, finally add the mushrooms. Zest whole lemons with a microplane grater removing only the bright yellow layer & avoiding the white bitter pith below the zest. Then half and juice the lemons. Cook the quinoa in boiling salted water, drain and lay out on a parchment lined sheet tray to cool. I’ve used a blend of white and red quinoa here, adding a handful of chopped parsley leaves for a burst of freshness. 6 plump shiitake mushrooms, sliced into strips across the button, then sliced in half. Bring a medium pot of salted water to a boil, add quinoa and bring back to a boil. Turn down heat to low and let quinoa simmer for 9 minutes, or until center is no longer white, and it still has a bite. Drain immediately, cool on a sheet tray lined with paper towels or parchment paper. Drain immediately, cool on a sheet tray lined with paper towels or parchment paper. Preheat oven to 375 degrees. Place butternut squash and cauliflower on separate sheet trays lined with parchment paper. Drizzle each tray with 1-tablespoon olive oil and toss to distribute evenly. 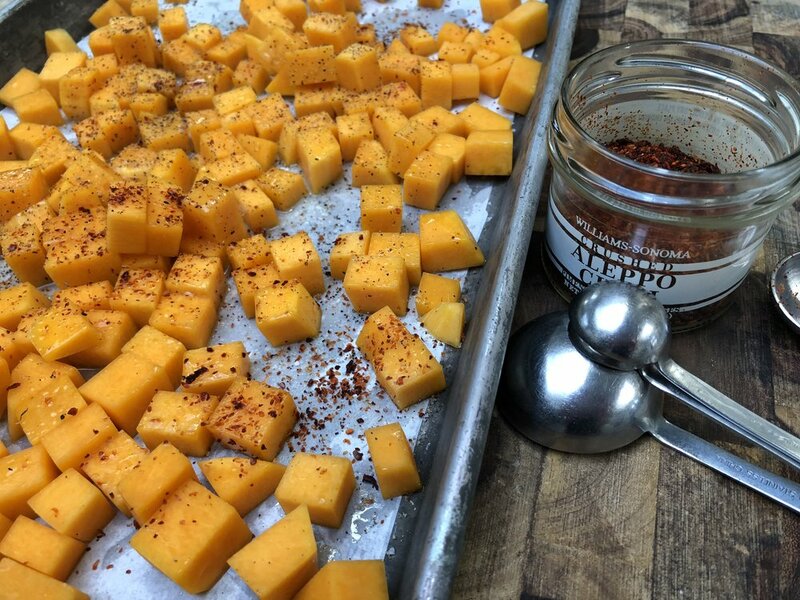 Season each tray with 1-teaspoon salt, ½ teaspoon black pepper and ½ teaspoon Aleppo pepper. Roast in oven for 25-30 minutes. Toss the vegetables half way through cooking time. If available, turn convection fan on for the second half of cooking. If not cook until tender and golden brown. Set aside to cool. In a large skillet over medium heat add 2 tablespoons of olive to lightly coat pan, add fennel and cook for 3-4 minutes, until it starts to soften. Add onions; adjust heat if needed to keep vegetables cooking gently, another 3-4 minutes. Add peppers and continue cooking until the vegetables are softened, lightly colored and almost cooked through. Add mushrooms and cook another 3-4 minutes or until mushrooms are tender and moist. Remove pan from heat and let cool. 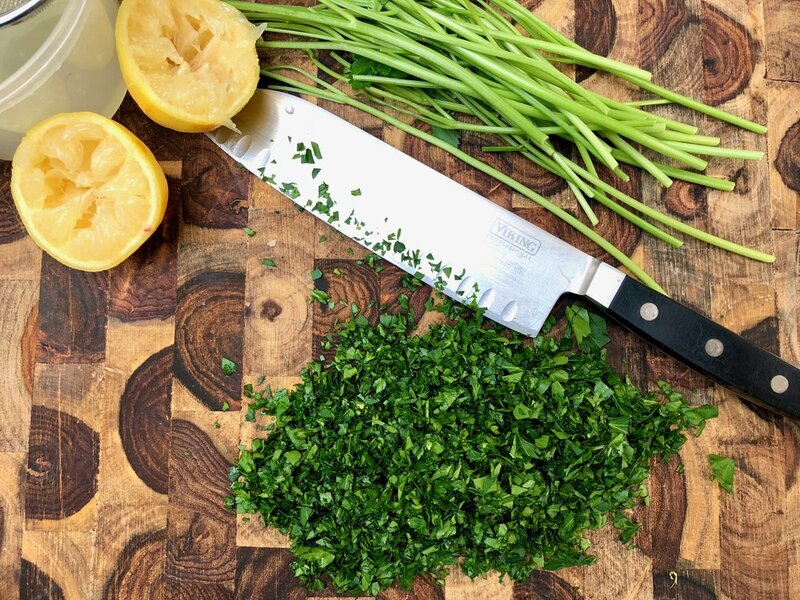 In a large bowl combine cooked quinoa, roasted and sautéed vegetables with all the seasoned oil remaining on sheet trays, chopped herbs, navy beans, lemon zest and toss gently. Drizzle with the remaining 2 tablespoons of olive oil, lemon juice and salt and pepper to taste. A healthy, bright and flavorful salad to savor any time! Veronica Mezzina, our editor, for transforming my sometimes-clumsy writing into a clear and cohesive story with ease and style. Annie Jaroszewicz, who has shared so much of her talent and expertise with me, in design, photo editing and business. She has constantly inspired me over the years. Thanks friend!